The 12’6” Expedition was designed for both the recreational paddler and the adventure paddler who want to push their personal limits and the limits of the sport of stand up paddle. The ES126 combines a traditional race board with the stability and glide of long distance cruisers. Start your Expedition today. 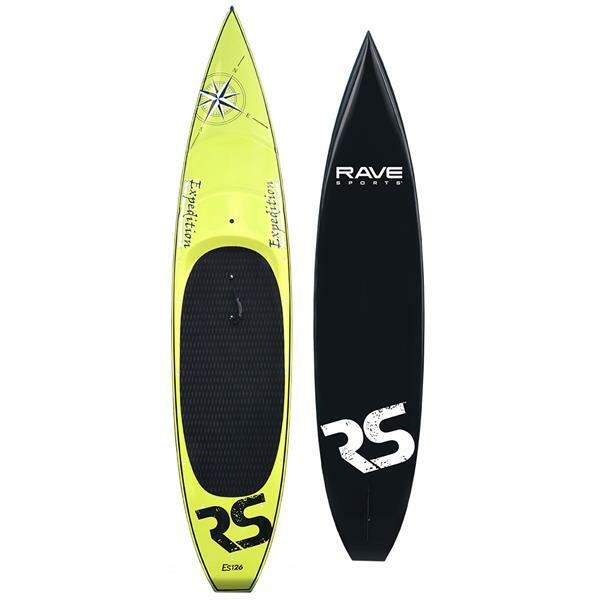 Designed in collaboration with RAVE’s Rider – Alex Linnell, the top long distance expedition stand up paddler in the world, the 12’6” Expedition paddle board sets the standards in expedition paddling. The nose features a wave piercing construction combined with a displacement hull to provide maximum forward momentum with minimal pitch. This provides high performance paddling that allows the board to knife through choppy waves and down winders with absolute ease. The Expedition stand up paddle board also features unique water shedding channels on the front deck that directs water off of the board keeping it light and quick while keeping gear dry. Not to mention increased volume at the front of the board that allows maximum carrying load and added buoyancy. The ES126 features minimal sidewalls to allow air to flow aerodynamically and tracks straighter with less effort in strong side winds. The sunken deck area provides a low center of gravity in addition to the 8” box tail and 29” width that provides maximum stability. The 12’6” Expedition SUP also features reinforced high impact areas, convenient tie down points, self venting plug, leg leash attachment ring, removable carry handle, 10” removable fin, and a limited 1 year warranty.